CGear is an Australian company that was established in 2003 developing mats for the military to use when landing helicopters in dusty and sandy landing areas. The mats keep sand from being blown around and potentially causing damage to the helicopter or personnel in the area. In 2010, they decided to take the concept to the recreational market and introduced it in the United States. They make the Sandlite Mats, Tote Bags and even sandals with the same sand-free technology. The Sandlite Sand Free Mat (Sandlite from here on out) comes in three sizes: small – 40”x 78”, medium – 61” x 78” and large – 78” x 78”. They retail for $49.99, $64.99 and $79.99 respectively. I received the small size for this review. Their website does not give the material content of the mat, but the tag on the mat says 100% polyester. The Sandlite mat can be folded or rolled up and there is a small elastic band and button to hold the rolled or folded mat together and a carry handle on the top for easy transport. The first thing I did when the Sandlite mat arrived was to open it and try it out in the yard. The small size is about the size of a large beach towel. The fabric of the mat is softer than I expected it would be and seems like it will be comfortable for sitting or lying on. CGear definitely put a lot of attention to detail into their design, one feature that really stands out to me is the fabric flap and elastic strap and button to keep the mat rolled or folded up. It is a small feature but will make it easier to carry in a beach bag or backpack. There are numerous uses for the Sandlite. 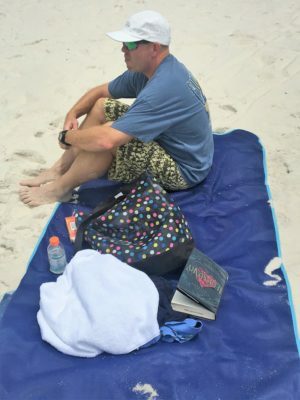 I anticipate taking it to the beach for use as a traditional type of beach towel, but I can also see using it while camping as an entry mat for my tent or under my hammock. I think my usage is only limited to my imagination. 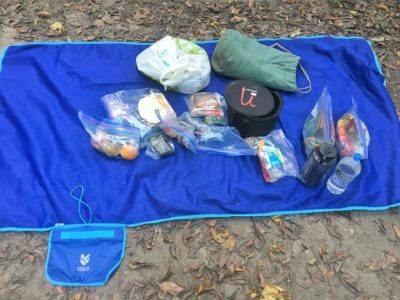 Over the past several months I have taken the CGear Sandlite Mat with me on all of my outdoor adventures. This has included multiple overnight and weekend car camping trips to Buccaneer State Park on the Mississippi Gulf Coast and Bogue Chitto State Park in Louisiana. 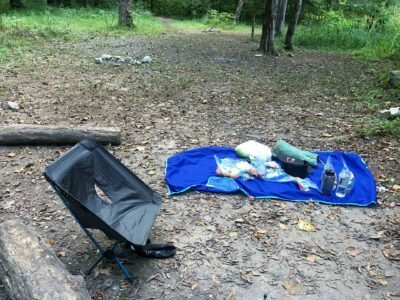 In addition, I used the Sandlite Mat on our trips to Pensacola Beach and while backpacking in northern Alabama to the Walls of Jericho in the James D. Martin – Skyline Wildlife Management Area. Temperatures have been mostly in the upper 90s during the day to the low 70s at night. Humidity has been high and there have been predictable afternoon thunderstorms. I have never reviewed anything like the CGear Sandlite Mat before, so I wasn’t exactly sure how I would grade it so to speak. After a summers worth of use, I think the characteristics that stand out to are the usefulness and durability of the mat. I want to start with the usefulness of the mat because I found it to be good for more than just a mat to take to the beach. However, I will start with beach performance since that is the main advertised use. I used it at beaches in Waveland, Mississippi and Pensacola Beach, Florida. The beaches feature sugar white fine sand that the Gulf Coast is known for. Any sand that got on the mat was easily wiped back and forth and fell through the mat. I also noted that water beaded up on the mat, but could also be wiped back and forth and it would filter through the mat as well. I liked that I could come back in from a dip in the Gulf and lay on the Sandlite Mat to dry and not be covered with sand everywhere. The small size was large enough for me to lay on and still have room to set items on the side. Overall, it worked well at the beach but that is not the end of the story. As I mentioned in my initial thoughts, the uses for the mat are limited only to my imagination. I found that I liked using it as a mat under my hammock. Poison Ivy is prevalent here in the South. So even though I look closely when setting up my hammock it is hard to completely avoid. 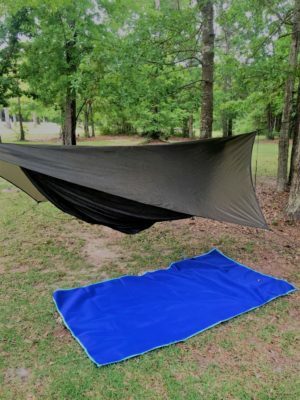 No worries, I toss down the Sandlite Mat and I have a clear area to get out of my hammock and a place to store my shoes and other items while in the hammock. Another use that I found for the Sandlite Mat is general storage at camp for stuff I don’t want to get in the dirt. For example, I used it to lay out and organize my food during the Walls of Jericho trip. I was able to easily sort meals and keep everything clean while cooking breakfast and dinner. The second characteristic I am evaluating the Sandlite Mat on is durability. The Sandlite Mat is tough. Of course it does well on sandy surfaces, but I also used it over rocks and roots. The fabric still looks brand new and does not even show a hint of wear. I felt comfortable standing or laying on the mat no matter what was underneath. This why I didn’t mind standing on it before crawling into my hammock. The price for the indestructible nature of the mat? It is heavy. There are lighter options that would work as a ground cloth. Overall, I am very pleased with the CGear Sandlite Mat and look forward to continued use for many more seasons. 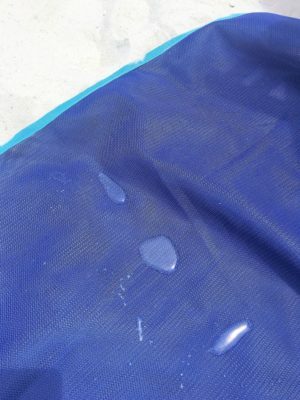 Special thanks to 4alloutdoors.org and CGear for providing the Sandlite mat for this review.